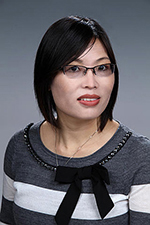 Congratulations to Dr. Jiwen Fan on receiving a 2014 Ronald L. Brodzinski Award for Early Career Exceptional Achievement. The award, which Pacific Northwest National Laboratory established in memory of Laboratory Fellow Ron Brodzinski, recognizes outstanding published scientific or engineering contributions in fields of national importance by individuals near the beginning of their professional careers. Fan, who was nominated by Dr. Beat Schmid, Associate Director, Atmospheric Sciences and Global Change Division, was honored for her outstanding record of research in atmospheric chemistry, cloud physics, and aerosol-cloud-climate interactions. Her work has significantly improved understanding of aerosol impacts on clouds, especially on clouds related to thunderstorms and their representation in regional and global models. She was also recognized for her contributions and commitment to the research community. According to Schmid in his nomination letter, "Dr. Fan is a gifted, creative, and productive scientist with exceptional career contributions to PNNL and the science community." Three other eminent scientists wrote glowing letters of support for Dr. Fan's nomination, from PNNL, The Hebrew University in Jerusalem, and the University of Maryland. Said Dr. Zhanqing Li, professor in the Department of Atmospheric & Oceanic Science & Earth System Science at the University of Maryland, "To put it in a simple statement, during my 20+ years of research and education career, I have interacted closely with over 50 young scientists. She is the most creative, productive, and diligent young scientist." Fan, along with the other Science and Engineering Achievement Awards honorees, Courtney Corley, Julia Laskin, and Pete McGrail, will be honored at the Pathway to Excellence Award Banquet in early September.